Posting yesterday on that day’s Bizarro, with only minimal commentary on it. Now a follow-up on two topics: what you have to know to make sense of what’s going on in the cartoon; and what makes it funny. What’s going on? It takes an enormous amount of background knowledge just to interpret what’s happening in this one panel. First, you need to know about the cartoon superhero Batman and various parts of his story and to know how to recognize the character, who’s one of the two figures in the cartoon. Batman is recognizable by his costume and by his reference to the Batmobile, which figures in his heroic exploits. Then you need to know that Batman undertakes these exploits along with a costumed sidekick, a boy named Robin. So the other figure in the cartoon is a candidate for a sidekick, but he’s a man (not a boy) that Batman addresses as Cardinal (not Robin), and he’s not in a bat costume. But Batman calls him to the Batmobile in the same fashion that he customarily calls on Robin. temp noun informal a temporary employee, typically an office worker who finds employment through an agency. ORIGIN 1930s: abbreviation. Robin of the Batman TV series is noted for his many catch-phrase “Holy…” exclamations. His exclamations are closely associated with his character and have been popularized in the American vernacular. The lines in the 1960s TV series were uttered by Burt Ward who played Robin, who delivered the exclamations in a nasal voice. Many of the camp quips are directly related to the plot; for example, “Holy Graf Zeppelin!” is uttered by Robin upon seeing an aerial balloon. In this case, X is response time, alluding to Cardinal’s slowness in responding to Batman’s call. Why is Cardinal slow? Because — something else you need to know — as senior prelates of the Roman Catholic Church (“princes of the Church”, just below the Pope), cardinals are customarily advanced in age. Why is the cartoon funny? 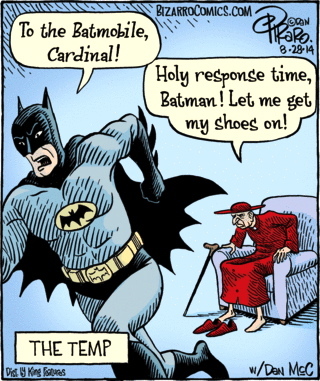 Two sources, one noted in my previous posting: the pun on cardinal, as a bird name (parallel to robin) for the name of Batman’s sidekick, versus the title of a dignitary of the Church. But then there’s the wonderful absurdity of choosing an (aged) dignitary of the Church as a temporary replacement for Batman’s boy sidekick: how could be possibly fill the role successfully? This entry was posted on August 29, 2014 at 5:51 am and is filed under Abbreviation, Formulaic language, Linguistics in the comics, Pop culture, Puns. You can follow any responses to this entry through the RSS 2.0 feed. You can leave a response, or trackback from your own site.